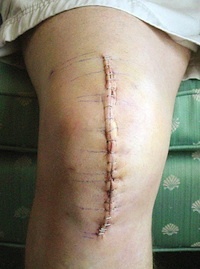 Total knee replacements are invasive surgeries that leave long scars accross the knee. They involve removing damaged bone and replacing it with a prosthetic. Osteoarthritis of the knee is very common in people age 65 and older. As the US population ages, more and more people are diagnosed with osteoarthritis. Since it can produce extreme knee pain that worsens over time, many people are desperate for a miracle treatment. While there are many medications, braces, and therapies for osteoarthritis of the knee, many people are turning to surgery for help. According to a recent New York Times article, total knee replacement surgery rose more than 800 percent from 1979 to 2002. With improving technology, this is a wonderful treatment for many people. But some people are not so lucky. For as much as 30 percent of the population, knee pain is not reduced after surgery. So almost 1 in 3 people may be undergoing knee surgery with no benefit. Considering that all surgeries are potentially life-threatening, this is a terrifying statistic. This does not mean that knee surgery is bad or ineffective, but it may not be right for everyone. Before looking for a surgical solution, try non-invasive arthritic knee treatments first. Why take the risk if you don’t have to?